The Cartoons had been cut up into vertical strips, for reasons to do with the manufacture of tapestries, probably in Brussels. They were reassembled and put up on the walls of the King's Gallery at Hampton Court for the first time in June 1697. They were taken down again for part of 1699 to allow for alterations to the ceilings, doors and panelling, resulting in the arrangement seen in later prints by Gribelin. Their installation at Hampton Court marked their transformation from designs to be used in making tapestries into exhibited works of art. 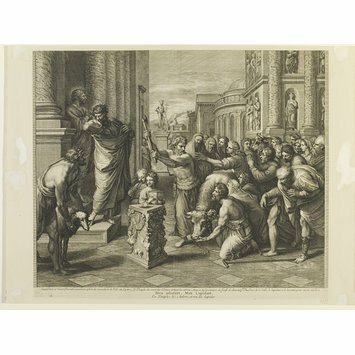 This print and its companion 'The Death of Ananias' (Dyce 2473) are the earliest prints which can truly be said to be "of the Cartoons". This print and its pair are the only two Cartoon prints which Audran executed before his death in 1703. According to George Vertue they were produced in Paris from copies of the Cartoons made by the painter Charles Jervas (ca. 1675-1739). These copies belonged to William III's Secretary at War in Ireland and Jervas' patron, George Clarke (1661-1736). When Jervas stopped in Paris on his way to Rome on a trip funded by Clarke, he seems to have proposed to Audran the engraving of his Cartoon copies. Gérard Audran was an acclaimed French engraver responsible for prints of history paintings by artists such as Charles Le Brun and Nicholas Poussin. At this date theire was no Englilsh engraver, or French engraver resident in England, capable of producing prints on this scale or level of linear complexity. In a town centre square with classical buildings a crowd has gathered to watch a sacrifice of two bulls and a ram. In the centre a man raises an axe to kill the bull standing in the centre. To the right, Saints Paul and Barnabas stand on a raised platform and there is a square plinth (altar) ornamented with carved festoons, angels, rams heads, animals a jug and a medallion. Behind this stand two boys, one playing pipes and the other holding a decorated box. In the background is a statue of Mercury on a plinth and behind is a landscape with more buildings. Front left a man has thrown away his crutches. This image in in reverse of the cartoon from which it is derived but is faithful in compositional detail. Saint Paul et Saint Barnabé preschent et font des miracles en la Ville de Lystre / Le Peuple les croit des Dieux et vent les adorer, mais à la suscitation des Juifs ils chassent St. Paul hors de la Ville, le lapident et le laissent pour mort. Actes. Ch. 16. 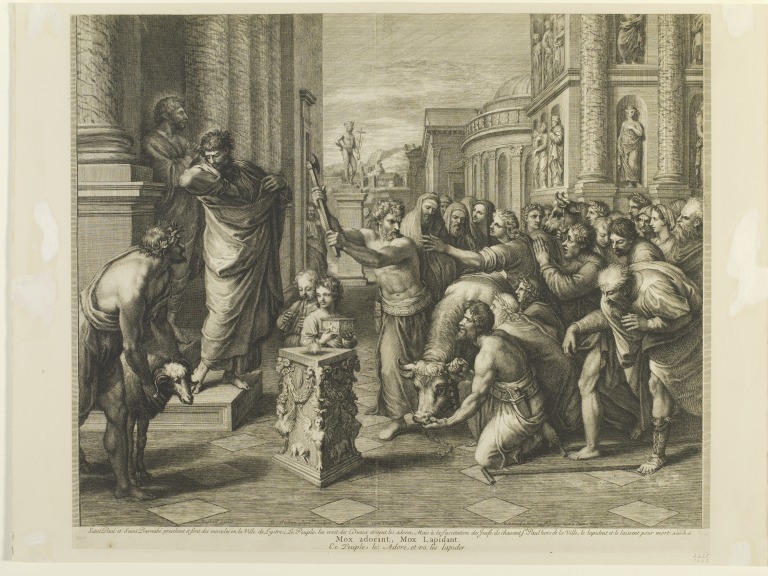 St. Paul and Barnabas at Lystra; from a cartoon by Raphael for the tapestries in the Sistine Chapel; etching and engraving by Gérard Audran; French School; c.1700.